Comfort versus protection is a battle many of us in the motorcycling world fight. In reality, protective gear needs to be relatively tight for ultimate protection. All you need to do is watch a MotoGP or World Superbike race to see how tight the racers' suits are. In fact, when you see one of these racers walk in his suit, it resembles something from the Planet of the Apes. Those of us in the real world don't always want to wear a monkey suit to be protected. The Olympia Recon 2 Air Pants are an example of relaxed protective wear. The pants are constructed of the 500D Cordura with mesh panels for cooling. Furthermore, the lower pant legs zip off to leave a pair of cargo shorts. For storage, there is a plethora of pockets. As for protection, the Olympia Recon 2 Air Pants have CE-approved armor in the knees. In a nice surprise, there is also removable EVA compression foam at the hips. Many of the new casual protective pants don't offer hip protection. So will these pants offer ultimate protection? In a word… no. There is no way a loose garment can keep the armor fully in place in a crash. However, the initial impact in a wreck is usually the most damaging. The fact that you have armor at all will certainly increase your chances of walking away from the fall. 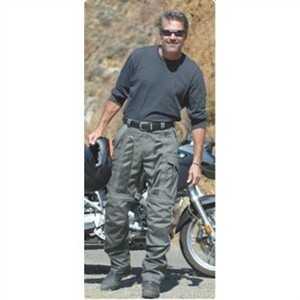 Click here to find this pant on Revzilla.com.